This one was shaping up to be everything I don’t want out of an encounter. 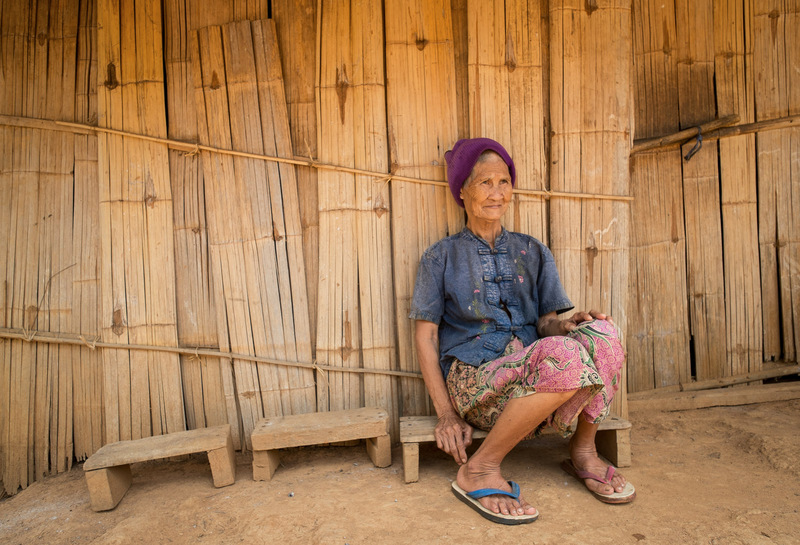 Driving along in the pickup on our return to the Akha village in Chiang Rai Province in N.Thailand where I was staying, I’d spotted a lady sitting in front of her house, watching the world go by. I glimpsed that she had a lovely strong face, and asked to stop the car so I could go over and ask her for a photograph. 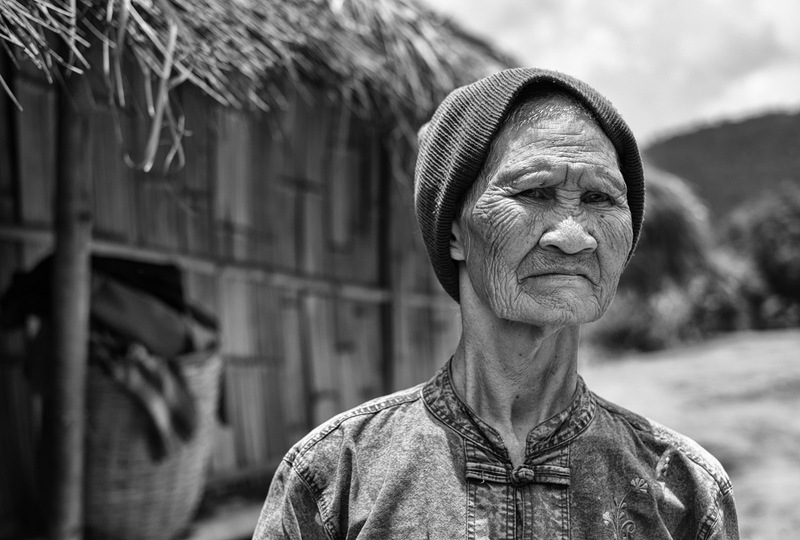 Apex (pronounced Ah-pay), my Akha driver, was too shy to come with me saying that she wasn’t from his people and he didn’t know her language, so I grabbed my cameras and went over to meet her by myself. 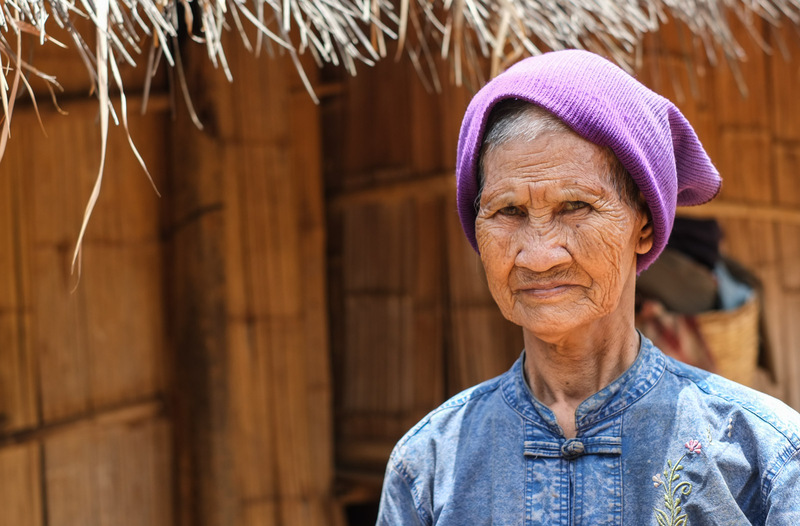 I guessed that she might be Lahu, and regretted not having had the energy to learn more of their language when I had stayed in a Lahu village the week before, but managed enough to say hello and ask if she was indeed Lahu, which she was. She agreed to a photo, but just after I’d taken my first ‘tester’ shot, my blooming battery ran out – I’d say without warning but I think it’s more likely that I just hadn’t noticed the warning. Rookie error. I then had to fumble around with my gear, losing the magic of the moment and the connection, and rather hurriedly snatched the next shot with my other camera and whatever lens came to hand as she was already getting up to leave. I’d had my chance. She gave me what I took to be a bit of a frosty look then turned and scurried off quickly into her house. I hate to see tourists leap out of cars, point a camera in someone’s face and then dash off as if they have some sort of right to just take what they want, disregarding the feelings of their subject, and I usually try to be very sensitive in my own photography encounters. However this time, distracted by my gear and being caught unprepared, I felt I’d blown it not only in terms of not getting the photos I’d intended, but more importantly, in giving her a negative experience, and I didn’t blame her for dashing off. As I was returning to the jeep though, I heard a voice behind me calling me back. I look round to see her coming after me with a bag in her hand. It was full of pineapples. She pressed it into my hand, smiled and said “aw bon ui ja” meaning “thank you”. I was touched and rather surprised. As well as having had a lesson on always being prepared and not letting clumsiness with your gear mess up the flow of an encounter, I’d also been shown how difficult it can be to read body language and facial clues across cultures. Although to me it had been the briefest of bungled moments, her kind gesture had shown me that it had clearly meant something to her, even if it was just that someone had stopped and noticed her. The bungling had maybe been more significant to me than her, and hopefully my attempt at her language and gentle approach had come across as a more positive experience for her than I’d realised. It was a reminder that how we approach a subject for a photograph, has an effect on them, which not only affects the resulting image, but more importantly affects the feelings of the person. Always good to remember in our eagerness to get the next great shot. I see so much that grates watching insensitive tourists photographing locals, when it could so easily be a much more positive experience from both sides with just a little common courtesy and thoughtfullness about the impact on the subject. Spoken or unspoken, every photo represents a two way human encounter, something we have a responsibility to always remain conscious of. What a magnificent story! Too bad you didn’t notice the battery before, but happy things worked out. Great pictures too! Thanks Tieme, pleased you enjoyed it – I’ll check out your blog too! As you say a lesson learned, we can get so carried away photographing we forget to check our equipment. Happy the experience ended beautifully for you. Everybody has feelings,nice to get a feel for the place first and always ask then showing the photos afterwards really helps. Clare you have had the added benefit of being able to give many of them a photo. Such a wonderful thing, as I am sure they will be treasured for years. Such an important message Clare. Really enjoying your blog, the stories bringing an extra dimension to your photos are wonderful. .